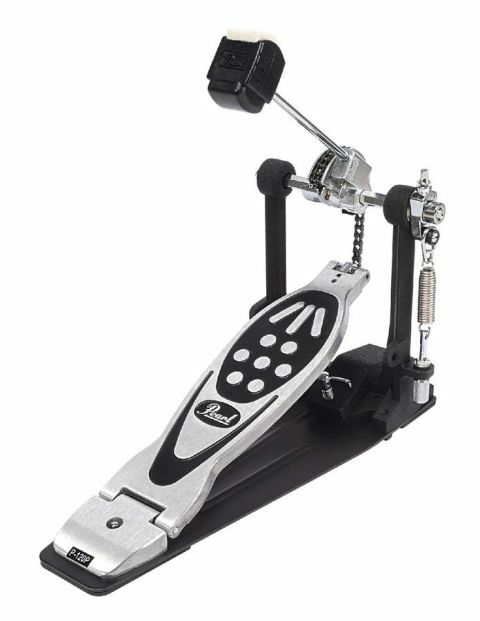 A quality budget bass drum pedal - well worth considering. Quick and responsive. Can be converted to a double pedal. Long the pedal included with each Pearl Export kit, at ﬁrst sight Pearl's P-120P could easily be confused with one of the company's Eliminator pedals. Since 2007 it has been equipped with Pearl's unique moveable Powershifter heel plate, which dramatically alters the feel of the action. A round cam and chain drive make it quick and responsive to play, and improvements to the spring ensure a silent performance. The bottom of the base plate, meanwhile, features a foam coating that grips surfaces like a limpet. With future upgrades in mind, Pearl has also cleverly designed the P-120P ready to be converted into one half of a double pedal.